Salman Rushdie is the author of twelve novels, his most recent being, Two Years Eight Months and Twenty-Eight Nights. He has also authored a book of stories and four works of nonfiction. His adaptation of his book Midnight’s Children was performed in London and New York by the Royal Shakespeare Company. 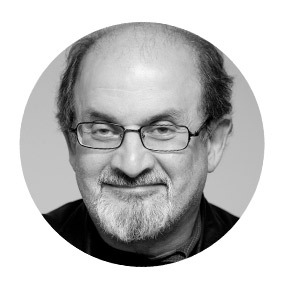 A Fellow of the British Royal Society of Literature as well as a Commandeur in the Ordre des Arts et des Lettres, Salman Rushdie has received countless honors and holds honorary doctorates and fellowships from a dozen European and American universities. He is an Honorary Professor in the Humanities at MIT and University Distinguished Professor at Emory University. Between 2004 and 2006 he served as President of PEN American Center and for ten years served as the Chairman of the PEN World Voices International Literary Festival, which he helped to create. In June 2007 he received a Knighthood in the Queen’s Birthday Honours. In 2008 he became a member of the American Academy of Arts and Letters and was named a Library Lion of the New York Public Library. His books have been translated into over forty languages.